On September 28, the world day of the deaf will be celebrated, and on that occasion will be held a manifestation of the 70 th anniversary of the existence of the NADHHRM.The manifestation will be held in the Macedonian Philharmonic in 12: 00 in the small hall. This organization has set up its foundations on 28 March 1948, and it has achieved fruitful activity, organized activity, and achieved valuable results in the field of protection, education and rehabilitation of the deaf and hard of hearing in Macedonia. 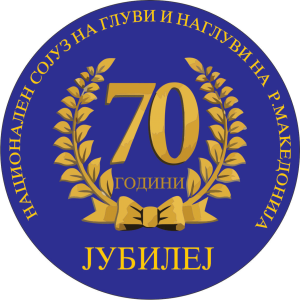 In its 70-year development, the Association of deaf and hard of hearing in Macedonia, excited the phase several times, made several changes in the name and the Statute, and changed the program priorities, the organizational frames, agreeing with the changes in the general system, development of the institutional network, social legislation and the needs of the membership. More than 250 members ( deaf and hard of hearing) from the Associations from the whole country, will be present as well as students from the “Partenie Zografski” school from Skopje and from the Institute for Rehabilitation for children with hearing impaired from Bitola, which will enrich this manifestation with their performance. Representatives from the Ministry of Labor and Social Policy will attend both by the Government and the Mayors of the municipalities in Skopje, who in a certain way contributed to the organization of this event. The event will be addressed by the President of the Association, Mr. Tomica Stojanovski and will inform the participants about the current situation of the Association as well as their organizational setup. He will inform the public about the reforms the Association in the next 2 years is planning to implement, all new projects that will be realized in future and are necessary in order to start an effective response to the needs of the deaf people in Macedonia.